'Visions of Glory' contains 12 beautiful and moving prayers in the Celtic Tradition (taken from the book entitled: 'The Edge of Glory', David Adam, Triangle/SPCK 1985), sung by Caritas Voices to memorable and atmospheric music by Scottish-based composer James Douglas. These prayers all have a wonderful melody and can be used in an individual setting or for congregational use. Douglas has wonderful way of setting words to music and makes great use of the texts. 'Cry of the Deer' consists of a series of six moving meditations led by the former Vicar of Holy Island, David Adam, taken from the book entitled: 'Cry of the Deer' (David Adam, Triangle/SPCK 1987). Interspersed by evocative and inspirational flute interludes before and after each meditation, this is an ideal recording for use in groups or individually. The music is taken from 'Hebridean Dream Music' by James Douglas and is performed by George Gwilt (flute). 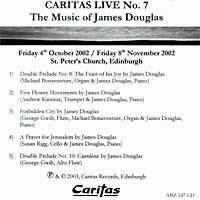 This piece is now available on the CD 'A Vision' by James Douglas. The music is a challenging flute solo with dramatic turns throughout. 4) Doors of Perception for Trumpet & Piano, Landscapes of Light for Piano & 3 Pavans from High Places (Clip), (Recorded 26/10/2001) (Listen online). 6) Larghetto in E for Flute & Piano, Threnody for Lost Time (Clip) for Cello, Flute, Trumpet & Piano), Double Prelude No. 7 (Cape Breton Island) for Flute & Piano, Double Prelude No. 8 (The Feast of his Joy) for Organ & Piano& Journeys to Iona for Organ. (Recorded 01/02/2002) (Listen online).